Eliard Martin is captain of the Mercury Blade, the fastest ship in the galaxy. With his small crew, he travels the stars looking for adventure and profit. When he tries to pull one over on a dangerous criminal overlord, he soon finds himself on a mission that will lead to more danger than he has ever faced before. With the help of a mysterious stranger, who is clearly more than she appears, they will fight to stay one step ahead of the most powerful forces in the galaxy. 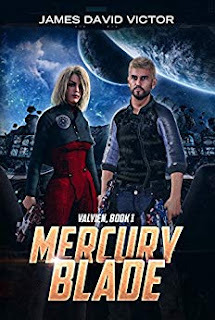 Can the crew of the Mercury Blade fly their way to freedom or will they be crushed by the opposing forces seeking their demise?